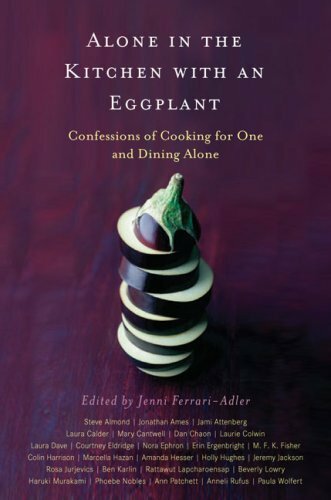 Alone in the Kitchen with an Eggplant is a quality compilation of accounts on cooking and dining alone. I got it during the going-out-of-business sale at The Cooks Library. I like short nonfiction pieces, and I knew with graduation ahead of me I’d probably be eating alone more often. The book features 26 essays from a former editor of The Onion, a New York Times food columnist, a screenwriter, some novelists and other writers. The range of styles means a everyone will find a few essays they love and some they’ll forget, but the book is never boring. I had two favorites, one of which I read aloud to Michael, the other Kat. Courtney Eldridge’s “Thanks, But No Thanks” brought out a range of emotions as she talked about the differences in how she ate as a child of a poor Catholic family and how she dined with her Israeli husband and mother-in-law, both with strong opinions on what makes a proper meal. The husband is now her ex and she’s learning to cook and eat alone. It was touching and often hilarious in its matter of factness. My other favorite essay, also memorable for its sometimes snarky perspective was “Que Sera Sarito: An (Almost) Foolproof Plan to Never Eat Alone Again.” Besides making me laugh repeatedly, Steve Almond struck me because I could relate to how he felt about writing. As writers, we’re looking for people to listen, for people to understand us. Cooking does seem to be a better way to get their attention. Why do you think have so many friends lately? [Edit] Recently saw a book called What We Eat When We Eat Alone, which is the same idea with different essays. It just came out, but has anyone read this yet? What a great review. I’m always on the lookout for great books, and the title of this one immediately caught my eye (I have a hopeless obsession with eggplant). Beautifully written. Hi Sandra, so glad you found us. Thank you for the kind words!